Here is a brief description of each cottage and Manor House. The table below compares the features of each. Click on the grey buttons below for a slide show of each cottage and Manor House. One bedroom, one bathroom, living room, full kitchen, no pets, small lanai, pink color, shower in bath, attached to Cottage #2, queen bed in bedroom, queen size sleeper sofa in living room. Sleeps 2 adults, 2 kids. View is about B+, 2 Flat Screen TV's, 2 a/c's, no dishwasher, has propane grill. Cottage is 425 sq. ft. Patio is 60 sq. ft. Note: Guests of Cottage #1 do not have access to the pool. One bedroom, one bathroom, living room, full kitchen, no pets, small lanai, green color, shower in bath, attached to Cottage #1, queen bed in bedroom, full size sleeper sofa in living room. Sleeps 2 adults, 2 kids. View is about B+, 2 Flat Screen TV's, 2 a/c's, no dishwasher, has propane grill. Cottage is 425 sq. ft. Patio is 60 sq. ft. Note: Guests of Cottage #2 do not have access to the pool. One bedroom, one bathroom, living room, full kitchen, no pets, large lanai, blue color, tub in bath, single house, queen bed in bedroom, full size sleeper sofa in living room. Sleeps 2 adults, 2 kids. View is A+, 2 Flat Screen TV's, 1 a/c, has dishwasher, has propane grill. Cottage is 450 sq. ft. Porch is 182 sq. ft. 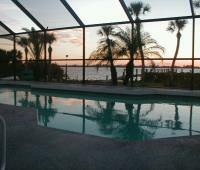 Note: Guests of Cottage #3 have access to the pool. One bedroom, one bathroom, living room, full kitchen, no pets, large lanai, peach color, tub in bath, single house, queen bed in bedroom, full size sleeper sofa in living room. Sleeps 2 adults, 2 kids. View is A+, 2 Flat Screen TV's, 1 a/c, has dishwasher, has propane grill. Cottage is 450 sq. ft. Porch is 182 sq. ft. Note: Guests of Cottage #4 have access to the pool. One bedroom, one bathroom, living room, full kitchen, dining area, no pets, large sunroom, yellow color, tub in bath, attached to Cottage #6 and laundry, queen bed in bedroom, full size sleeper sofa in living room, full size sleeper sofa in sunroom. Sleeps 4 adults, 2 kids. View is B, 2 TV's (One Flat Screen and one CRT in bedroom), 2 a/c, has dishwasher, has propane grill. Cottage is 625 sq. ft. Porch is 36 sq. ft. Note: Guests of Cottage #5 have access to the pool. 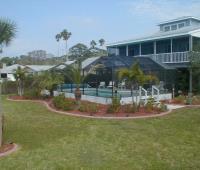 One large room, like efficiency, with living area and full kitchen, no pets, one bathroom, no lanai, purple color, shower in bath, attached to Cottage #5, queen size bed, Sleeps 2. No view. 1 Flat Screen TV, 1 a/c, no dishwasher, no propane grill. Cottage is 225 sq. ft. Note: Guests of Cottage #6 do not have access to the pool. 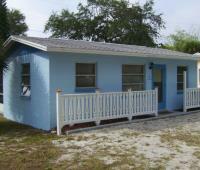 Four bedroom, Two bathroom Key West Style home. 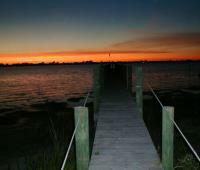 Living room, Large Eat-in kitchen, no pets, very large bayfront deck, large shower in bath 1, tub/shower in bath 2. Washer/Dryer in home. King (Bed 1,4), Full (Bed 2), Twin x 2 (Bed 3). Sleeps 6 adults MAXIMUM plus possible 2 kids. View is A++, 5 Flat Screen TV's, central a/c, dishwasher. Home is 2500 sq. ft. Deck is 320 sq. ft. Guests of Manor House have access to the pool.